Since I'm a fan of her previous novels, I am very honored to be a part of the cover reveal for Miranda Kenneally's 2014 YA contemporary: BREATHE, ANNIE, BREATHE. This book sounds amazing, and this beautiful cover only adds more excitement to my want to read it! Thank you so much Miranda for asking me to be a part of the cover reveal. 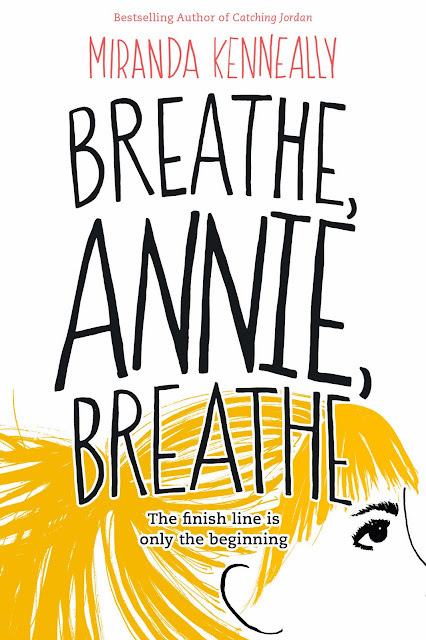 About the Book [from goodreads]: Eighteen-year-old Annie Winters can barely run a mile without wheezing. Still, she’s training to run the Music City Marathon in seven short months. Running is so not her thing, but she has to finish what her boyfriend started… before he died. Annie feels guilt that she’s still alive and blames herself for his death; she has to do this to honor him – running a marathon was his dream. Plus training gives her something to do, it’s a distraction. So is Jeremiah Brown. What do you think of the cover?? Have you added this book to your TBR list for 2014? If you're not familiar with Miranda's previous novels, check out my reviews: CATCHING JORDAN, STEALING PARKING, THINGS I CAN'T FORGET, and RACING SAVANNAH. LOVE this cover! So fun! Hmm, not really the type of cover I'm drawn to, sorry. But, I'd like to know what's wrong with Annie, does she have asthma? I actually love the synopsis very much so that I will pre-order this book without a doubt. But honestly, I dislike the cover. I mean, it's cute.. But since the book is a part of Hundred Oaks series, I hope the cover could be in the same type as the other 4 books.